Some see it as an energy holy grail: an “artificial leaf” that uses the power of the sun to split and rearrange molecules to create clean, renewable fuel. About five years ago, scientists pioneered and refined an artificial leaf that uses sunlight to separate hydrogen from oxygen in water molecules, to create hydrogen fuel. This summer researchers at the University of Illinois at Chicago released promising results taking a different approach. Their artificial leaf uses sunlight’s power to separate carbon dioxide into carbon monoxide and oxygen. Then the carbon monoxide is turned into synthetic gas — or syngas, which can be used as a vehicle fuel — burned to generate electricity or enriched into diesel or other fuels. Researcher Amin Salehi-Khojin said this is the first time an artificial leaf has been used to make syngas. “We need a source of energy to activate the reaction — instead of external electricity, we just use the energy from the sun, nothing else,” said Salehi-Khojin, an assistant professor of mechanical and industrial engineering at UIC and senior author on a recent paper explaining the technology. Salehi-Khojin visualizes artificial leaves located in tandem with solar farms at places where the syngas can be used onsite. If the arrays are located near chemical plants, factories or fossil-fuel-fired power plants, they can tap the carbon dioxide emitted from those operations, avoiding its release into the atmosphere and essentially recycling it into more fuel. The key to the UIC team’s technology was the development of a catalyst that achieves carbon reduction – breaking carbon dioxide into carbon monoxide – much more efficiently and cheaply than other methods. The UIC researchers use tungsten diselenide nanoflakes as a catalyst, and they use a special formula of water and ionic fluid to prevent the chemical reaction from damaging the catalyst, a pitfall that has plagued similar strategies. The ionic fluid and catalyst are located on the cathode side of the artificial leaf. The anode side is coated with cobalt oxide in potassium phosphate electrolyte. 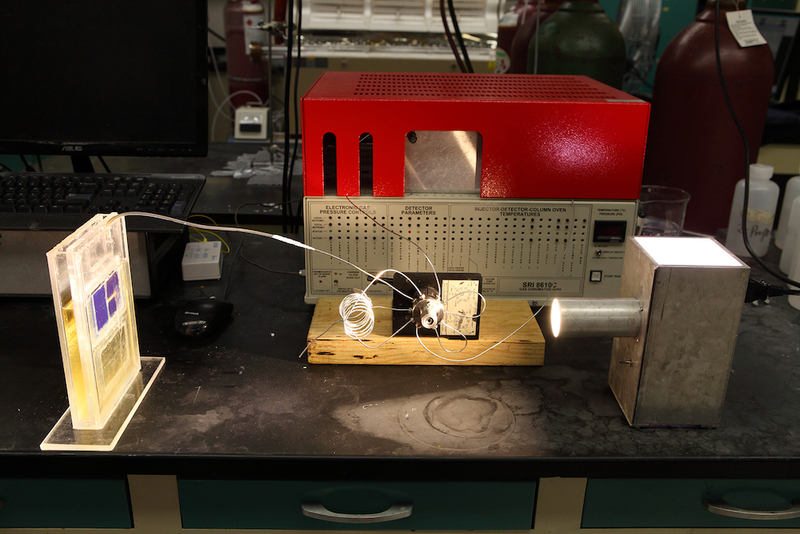 “Hydrogen and carbon monoxide gas bubble up from the cathode, while free oxygen and hydrogen ions are produced at the anode,” notes UIC’s press release. Chemist Nate Lewis is scientific director of the Joint Center for Artificial Photosynthesis at the California Institute of Technology and a national leader on artificial photosynthesis. He said the UIC research is a valuable contribution to the larger field. Lewis explained that there are three primary ways to use an artificial leaf. The one his lab has focused on most is separating out hydrogen as a fuel for planes and vehicles or to be burned in peaker plants making electricity. Such plants can be located on the grid, providing energy storage on the grid to even out electricity supply when solar or wind power fluctuates. At the Wyss Institute at Harvard University, energy professor Daniel Nocera uses an artificial leaf to separate hydrogen from water, then uses “hydrogen-eating bacteria” to turn it into liquid fuel. Artificial leaves can also be used to separate nitrogen out of the air, using it to make ammonia for fertilizer. And as Salehi-Khojin’s group showed, artificial leaves can separate out carbon monoxide which can be combined with other molecules to make syngas. Syngas could also be used for plants providing energy storage on the grid. Lewis said that practices developed and lessons learned from one way of using the leaf are often transferable to other methods. He sees the various types of artificial leaves as different routes to the same end, since chemical plants, oil refineries and the like have long been used to combine and convert different compounds. In other words, the artificial leaf uses free, clean power from the sun to provide the molecular raw materials that can be used to custom-make fuel for power plants or vehicles. As with any renewable energy innovation, it remains to be seen whether the UIC method or any other artificial leaf will be able to make large quantities of energy or fuel that is cost-competitive with other sources. A National Geographic story about Nocera notes that the startup company he founded after unveiling artificial leaf breakthroughs soon stalled because the hydrogen fuel couldn’t produce energy for the grid or combustible fuel competitively with other technologies and sources. “I did a holy grail of science. Great! That doesn’t mean I did a holy grail of technology,” Nocera was quoted in National Geographic. Lewis said that while the technology is still in the early stages, it holds significant promise. In June, Lewis testified about the promise of artificial photosynthesis before the U.S. House of Representatives Committee on Science, Space and Technology’s energy subcommittee. Capturing carbon dioxide emissions for enhanced oil recovery could significantly increase if Congress passes tax incentives and other policy changes similar to those that fueled the explosive growth of renewable energy, according to a new report by the Great Plains Institute.